News Article - RSLN Registered Users Count Tops 25,000! RSLN Registered Users Count Tops 25,000! The Respondersafety Learning Network (RSLN) is thrilled to mark its newest milestone — more than 25,000 registered users now belong to the network. This is just the latest in an exciting month for RSLN. In November, RSLN welcomed almost 3,000 new users, the largest number ever in a single month. 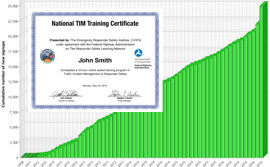 And, the new National TIM Training Certificate has been earned by more than 1200 roadway responders. Coupled with the release earlier this year of the new NFPA 1091 Standard Traffic Control Incident Management Professional Qualifications, these are exciting and rewarding times for the traffic incident management and roadway safety effort. In addition, RSLN was recently awarded a Fire Prevention & Safety grant from the U.S. Fire Administration, which will enable the network to produce new roadway safety programming throughout 2017. RSLN expects the new programming and the TIM certificate to continue to grow the registered user base in the coming months. Please help spread the word by sharing the RSLN on your social media accounts and encouraging your colleagues to register.